Mugwort: John the Baptist’s Girdle? Mugwort is one powerhouse of an herb that has been used since ancient times for cooking, beer-making (before hops), magic, medicine, smudging, protection, dreamwork and more. It’s genus name is Artemisia since it was dedicated to the Greek moon Goddess Artemis whose Roman name is Diana. It has a long history of use in China, Japan and throughout Europe. Native Americans value the plant as well. 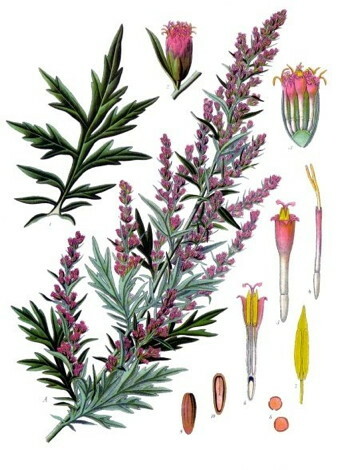 Judika Illes in The Elemental Encyclopedia of 5,000 Spells, also nots the origin of the story: “Allegedly John the Baptist wore a girdle (belt) woven from mugwort while in the wilderness. A similar magic belt allegedly provides you with good health.” She also offers the following suggestion for it’s modern magical use: “In time for St. John’ Eve, weave a magic belt from mugwort, knotting your ropes and intentions into the girdle. Wear it while dancing around the bonfire; at some point before the night ends ‘and the bonfire burns out, toss the belt into the flames to receive a year of good heath. The medicinal uses of mugwort are well documented on other web sites so I will not cover it here. My interest in this wonderful herb has to do with its magical properties. As a protection herb, it can be made into a smudge stick and used to ward off negative energies/spirits. Native Americans also used it in cleansing rituals and sweat lodges. In ancient times it was hung over doorways for protection and was also placed inside Roman soldiers sandals for the same reason. As a dream herb, it can be brewed into a tea (there are some precautions to this so read carefully before you ingest it!) or, more safely, placed in a dream pillow. It is believed mugwort helps us to better remember our dreams, both during sleep and in shamanic trances. A Wiccan priestess friend of mine also recommends that a sprig of mugwort should be placed in the room of a person who is dying since it is a bridge between the worlds. I have also heard that dried mugwort added to a fire will help keep it smoldering for a long time, and the stalks make good kindling. Furthermore, mugwort’s long stems and beautiful leaves make wonderful wreathes and garlands. Did I also mention its easy to grow…but be careful so it doesn’t take over your herb garden! This entry was posted in Herbology and tagged Pagan, Spirituality, Wicca. Bookmark the permalink.